While I was reading Adam Lasnik's "little algo secret", I noticed the Google Groups Beta design is now officially out of beta. I personally really like the new design. The new design has changed from the orange/yellow color to a light blue color. It is more Web 2.0 stylish and has some new features. 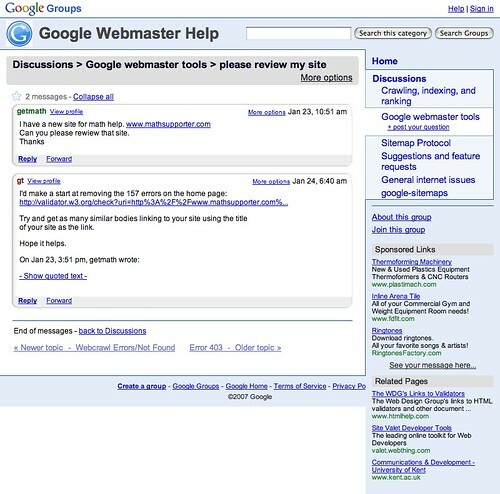 Of course, Google Blogoscoped has the before and after screen captures and links to some issues with the new design. 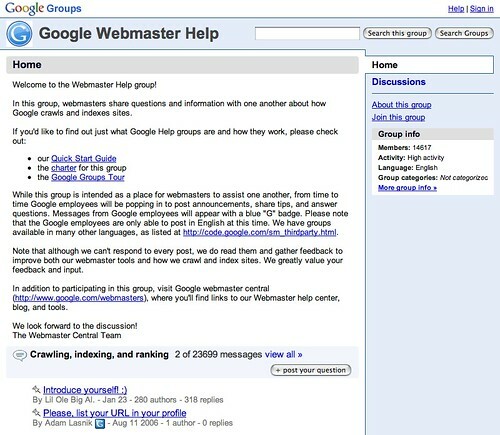 For a guided tour of the new Google Groups, click here. New Features Include: - Pages. Create and contribute to shared web pages with simple drag, drops, cuts, pastes, and clicks (i.e., no coding). - Customized look and feel. Select pictures, colors, and styles to express your group's style. - Member profiles. See who else is in the group and read their profiles. Personalize your own profile with a photo and other details. - File sharing. Post documents that anyone in the group can access. - Easy reading of group discussions. Read easily in a Gmail-style interface. Forum discussion at Search Engine Roundtable Forums. And I'll let you in on a little algo secret: There is no single magic number. People who say "The guaranteed optimal keyword density is [x]%" would ideally meet the same fate from an angry English teacher. Or Googler or Webmaster. Which we discussed already here.